Nevertheless, ToA’s Scott Johnson doesn’t eschew the more ragged edges of experimentation. “Screaming U at Mimi,” the meditation of a post-blues lothario, mixes a rocking chair riff with warbling vocals and screeching guitars (the last mercifully low in the mix): “Ooh baby, the mystery / is in my mind / but my heart is warm / all the time.” The sentiment of the lines pervades much of the album—even where there is no lyrical content to spell it out. “Hop (with Scotch)” is an especially captivating track: distorted drums, peeling vocals/guitar, and a kinda raga vibe raise it above the rest of the album. Soon enough, the dissonant picking and slurred vocals of “Fiddle Crap (with Bacon Grooves)” brings the album back into the realm of exhausted self. The latter track sounds like it could be a missing cut from Steropathetic Soul Manure, Beck’s early 90s ode to his own frustration with the musical arts. 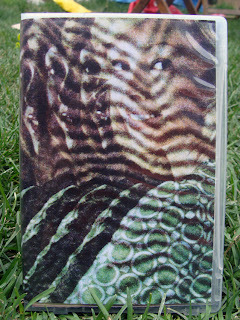 Johnson is best when blending the two impulses—the emotional fullness experienced in musical flight and the imminent return to the incomplete self—as he does on “Mutuality.” There’s a sort of alternation between the two states over the course of this double cassette, as though the trippy voyage must always be reconciled with the earthbound body and its not-so trippy cares. “Mutuality,” with its repetitive first guitar and second guitar alternating in the bass and treble ranges, simultaneously keeps the listener on the hook and eager to take off. The final track, “Hymn for She,” has a truly rad two-guitar, two-vocal harmony and deploys that old oceanic trick of building, cresting, and washing away. Woulda been fine by me if it were a few minutes longer. 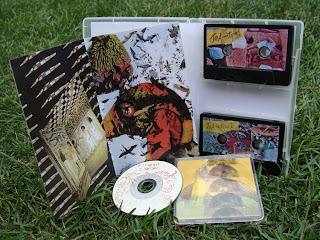 In any case, the entire set is thoroughly recommended.